For example, if you had an account with a balance of $10,000 and an interest rate of 12%, the debt-to-interest ratio is 833 ($10,000 / 12 = 833.33). Accounts with the lowest debt ratio get paid first. Note that the formula states “current” interest rate – this means that the formula takes promotional interest rates into consideration. Let’s take a look at some real word examples and compare the three different payoff methods. For our example, we’ll use a set of 4 different debt accounts with total minimum payments due of $590/month. 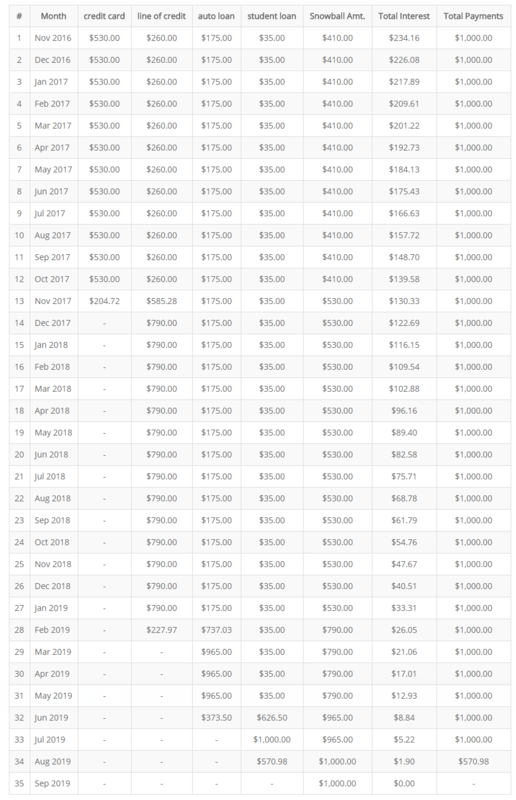 We have $1,000 in our total monthly debt budget to work with. The standard debt snowball method pays the accounts with the lowest balance first, so the student loan gets paid off first even though it has a very low interest rate. The first victory happens quickly at 7 months, but the next one takes place almost a full year later at 18 months. The average gap between victories is 8.75 months. The debt avalanche pays the accounts with the highest interest first, so the credit card and its’ high interest rate are the first in line. 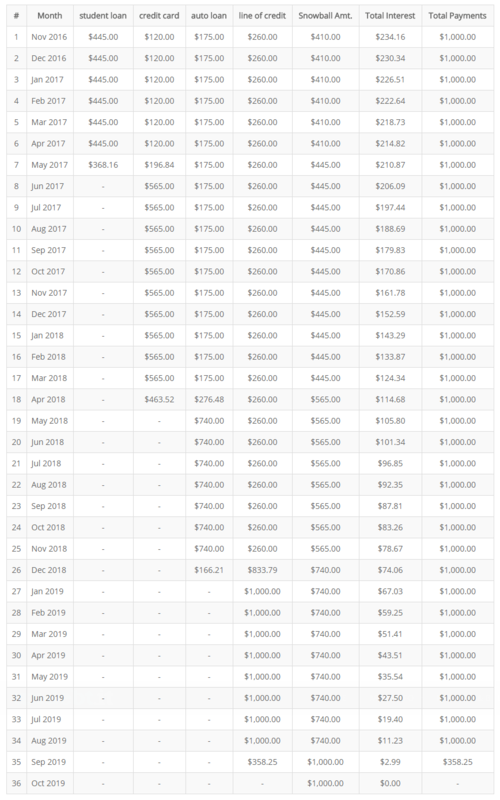 It will take 13 months to pay off that account, but you will save you almost $800 in interest versus the snowball method. The average gap between victories is 8.5 months. The debt-to-interest ratio plan starts off the same as the avalanche by paying off the high interest credit card first. The average gap between victories is also 8.5 months, but the second victory takes place 5 months later versus 15 months later on the avalanche plan. This plan will cost you approx. 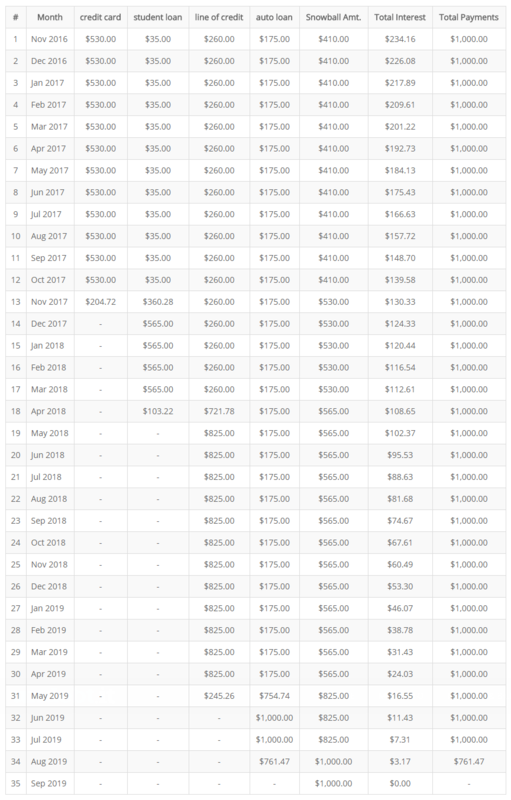 $200 more in interest than the avalanche method and will finish on the same month, but the payoff victories are spread out a little more and may help you stay motivated. See the full amortization schedule here. This plan is available to all users (paid & free as well as users of the debt snowball calculator on the main site). The idea for this plan came from an article called “The Debt Spiral” written on the blog “Frugal Fan”. The difference is that mine takes into account the current interest rate, so any active promotional interest rates are factored into the equation. Hope you like it and as always, spread the word on social media if you like the site. Would the debt to interest ratio be the same as, say, getting a utilization to the optimum 30% or would that be a different set of calculations? That’s a different set of calculations. This one isn’t concerned about utilization at all, just interest paid. The plan you want is called “highest credit utilization first”.